There is also a maquette of the ducklings. 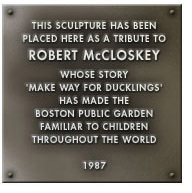 It was 1985 when Suzanne DeMonchaux, an urban planner asked me if I would like to put a bronze sculpture of Make Way for Ducklings into the Boston Public Garden. Therein lies a long tale of her proposal writing, our meeting and working with Robert McCloskey, of acquiring the sponsorship of the Friends of the Boston Public Garden, of having my design accepted by the Boston Art Commission, the Landmarks Commission and the Parks and Recreation Department. Then there was the problem, as always, of fund raising. 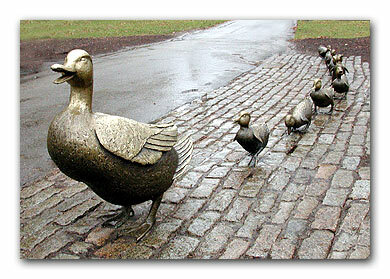 It took two years to go through this process but on October 4, 1987 a bronze sculpture of Mrs. Mallard and her eight ducklings was installed on old Boston cobblestones. I treasure time that I spend standing near the sculpture and watching all the children hug, kiss, climb on and feed the ducks. How fortunate I am to have made this sculpture which, thanks to Mr. McCloskey, has given so much pleasure to so many. The Ducklings turned 20 years old. We celebrated with music, singing, face painting, magic, and honored guest Mayor Thomas M. Menino on Saturday, September 29, 2007 at the Boston Public Garden.